Play like the pros! Xtrfy's H1 Pro headset allows you to hear every acoustic detail in the game with crystal clear sound. No opponent can hide, no orders from a teammate will go unheard. Even professional gamers opt for peripherals from Xtrfy. 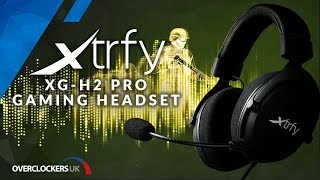 Xtrfy's H2 Pros offer a premium audio experience for gamers and eSports professionals. The audio quality of H2 Pros enable users to pick up on subtle in-game audio cues, such as those made by an opponent, and so can make the difference between scoring a kill and being killed. Noteworthy features of H2 Pros include dynamic 53 mm drivers, which ensure a full and rounded sound. The headphones are capable of outputting frequencies ranging from 45-18000 Hz with an impedance of 32 Ohm. While the unidirectional microphone is removable and has a frequency range of 5-18000 Hz. For gamers, not only should headphones have a great sound, but they should be comfortable to wear for long periods of time. Once again the H2 Pros do not disappoint on comfort. H2 Pros are made from a lightweight but sturdy aluminium frame and are covered a soft memory foam. The over ear cups are cushioned and completely enclose the ears to adapt perfectly to the user. The H2 Pro are also lightweight, weighing only 330g . The headset is connected via either a gold plated four-pin or a double 3.5 mm audio jack. The cable attaching the headphones to the audio source is 1.2m long and is braided. More links for "H2 Pro Gaming Headset (XG-H2)"